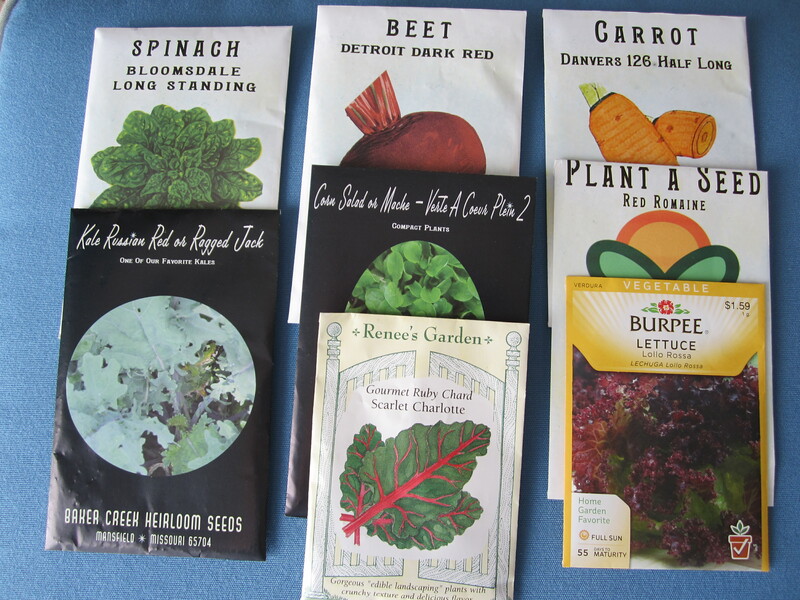 There are several plants that can go into the garden now as seeds and will reward you with greens into the fall and, if you’re lucky, up to Christmas and beyond. The yellow wax beans are finished in my community garden bed. I was away for a week and just picked the last of them a few days ago. They were old so I cooked them a long time with a slice of bacon, but they were too stringy to eat. It was worth a shot, but they ended up in the garbage. I didn’t put them in my compost bin as they had fat from the bacon on them. I’ll pull those beans up in the next few days and plant some kale and lettuce. I’ve already done that at home and here are some photos of Russian Red Kale which is a terrific green to plant now. Kale is one of the healthiest things you can eat. You can even make Kale Chips out of the leaves. These seeds were planted 8-14-14 and a week later had secondary leaves. The tomatoes in my community garden bed are still producing so they won’t get pulled out yet. When I do, I will make sure the cut up the plants before they go into the compost bin. So…consider a fall/winter garden. You will be rewarded. Most of us have already harvested the last of the summer’s produce. 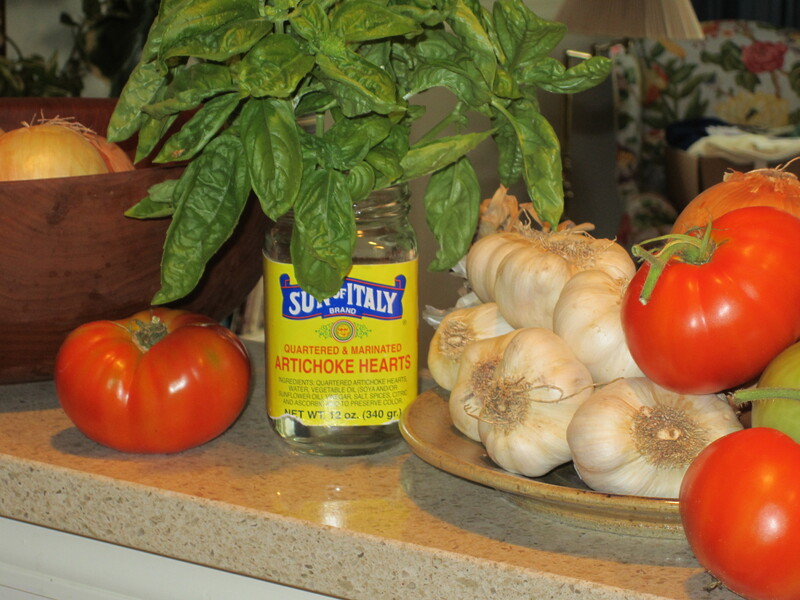 Disclaimer…the garlic below did not come out of my garden. I had garlic, but hadn’t gotten around to cleaning it. The heads I bought at the store made a prettier photo. However, I was sorry to see a lot of tomatoes in the community garden go to waste. We need to figure out how to utilize the produce our own families won’t use. All the green tomatoes from my bed went on newspapers in the garage. As they ripened, I got enough to can two more batches of tomato sauce . Now is the time to put in a fall garden. Broccoli, cabbage, and kale are among the plants that love this cooler weather. 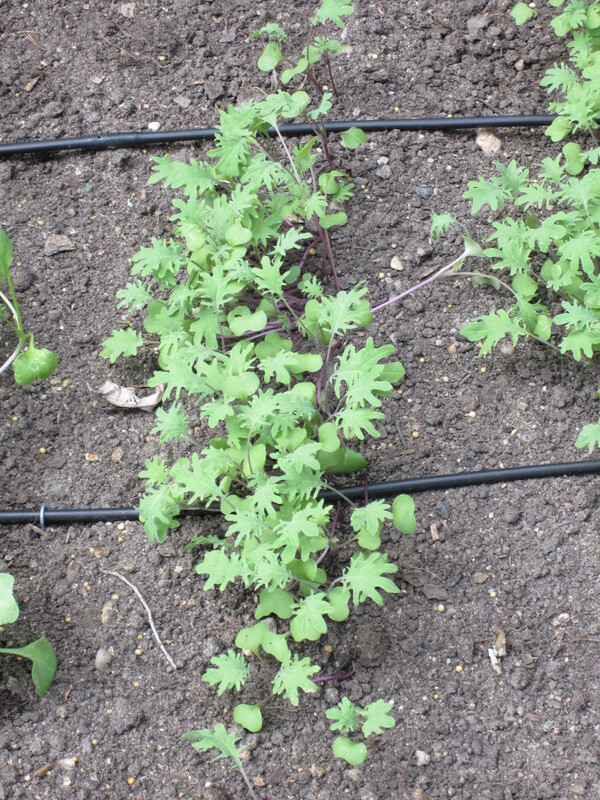 Seeds of some lettuces, arugula and other greens can be sewn with time to sprout before the really cold weather comes. 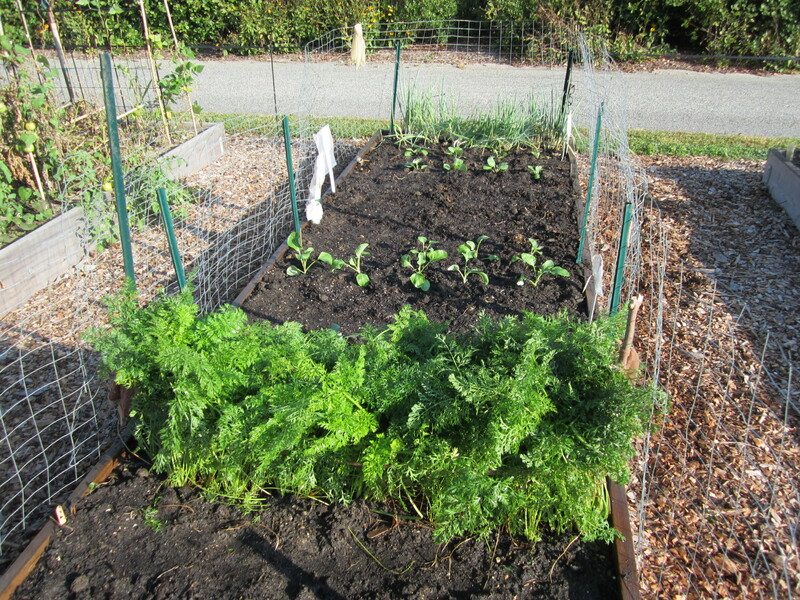 Last year’s very mild winter meant we ate greens all winter from my raised beds at home. I had covered them with Agribon, a floating row cover. 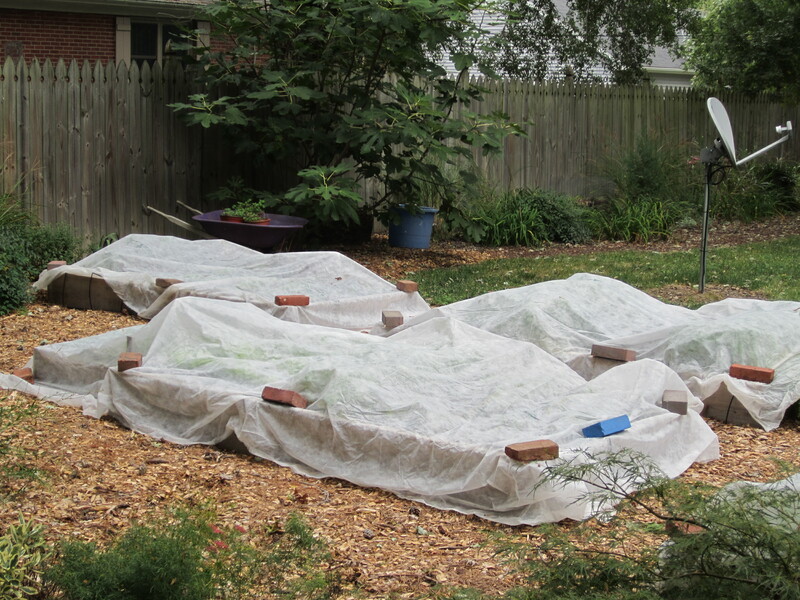 Originally I did this to keep the leaves out of the beds and then was too lazy to take the covers off. Little did I know the reward in store. We didn’t buy any greens until I pulled things out in April. I laid the Agribon directly over my plants and secured the edges with a couple of bricks. When the plants grew bigger, I gave them more room by adjusting the Agribon and the bricks. Sun and rain go through the floating covers. Some people use metal hoops they purchase or make. I plan to put a floating row cover on my community garden bed and see how my fall plants make it through the winter in that location. This photo is from my raised beds at home. The covers went on October 8 because we were expecting a weekend of rain. People also use floating row covers to keep insects off their plants. Next spring I’m going to give that a try. Maybe my broccoli will be worm free. That would be lovely! On Saturday I was at the Farmer’s Market and stopped to water my bed at the community garden. As I was leaving I saw a woman with two young children in tow. From the alley she was pointing things out about the plants so I asked if she’d like to come in. She was delighted. Our deer fence, which isn’t proving very useful in keeping the deer out, does seem to keep people out. That’s unfortunate. I asked the little girls if they liked carrots. They were willing to try a bite, so I pulled some from my bed, washed them off with the hose (I love having water so close by) and the kids each had the freshest carrot they had ever eaten. I asked if I could take their picture and here it is. The smallest girl is not happy in this photo, but was a minute before when she had a bite of carrot. These serendipitous moments are the best part of the community garden for me. Did I make a couple of fresh carrot converts on Saturday? Maybe. We have some new signage in the garden. 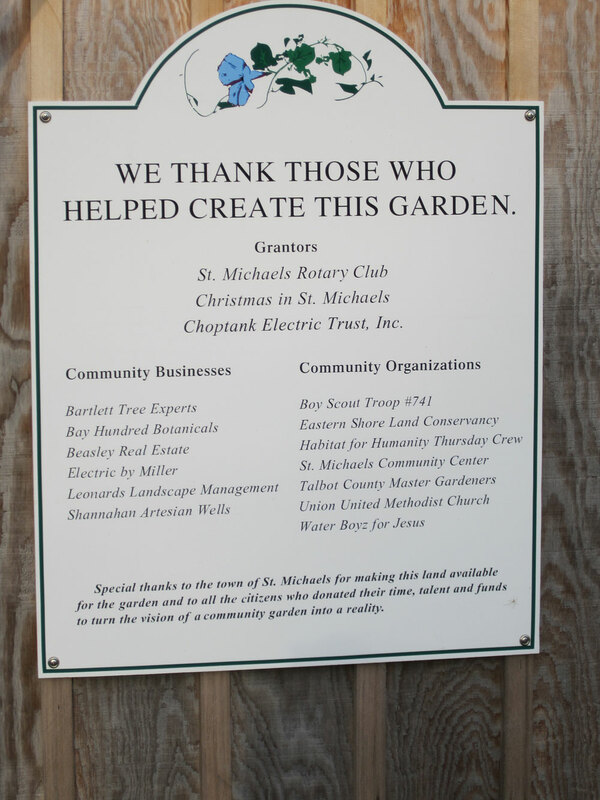 Val Kenn Gray, Lin Clineburg and Joanne Buritsch collaborated on this sign which thanks the groups whose generous help was instrumental in getting our community garden started. The sign was placed on the side of the garden shed where it is visible and adds some decoration to an otherwise blank wall. Well done! Let’s all remember to thank and patronize the groups that support our community. 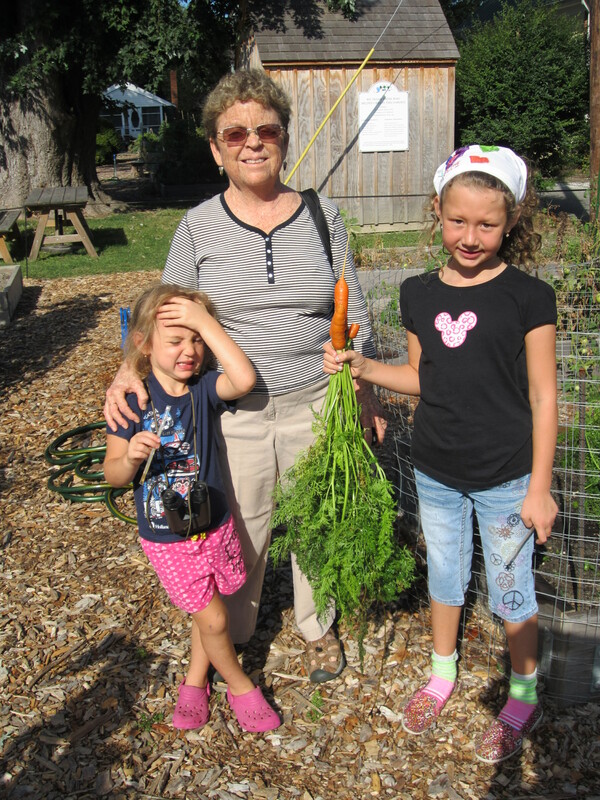 Kids, carrots and thank you signs are all a good thing in our St. Michaels Community Garden. 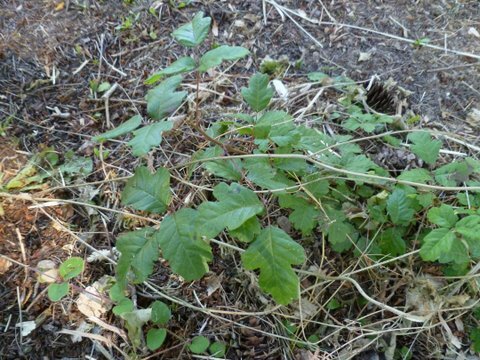 Poison Oak – In Our Neighborhood? After I posted about finding poison ivy in my garden bed, Master Gardener Lin Clineburg (bed #10) sent me this photo of poison oak. I’ve lived in Maryland for more years than I’d like to admit and have never seen it. The leaves do look like oak leaves. People tell us it’s around on the Eastern Shore. 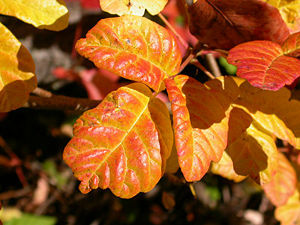 Have any of you seen poison oak in our area? This photo is poison oak in the fall. Gorgeous color, but I don’t want it in my yard. 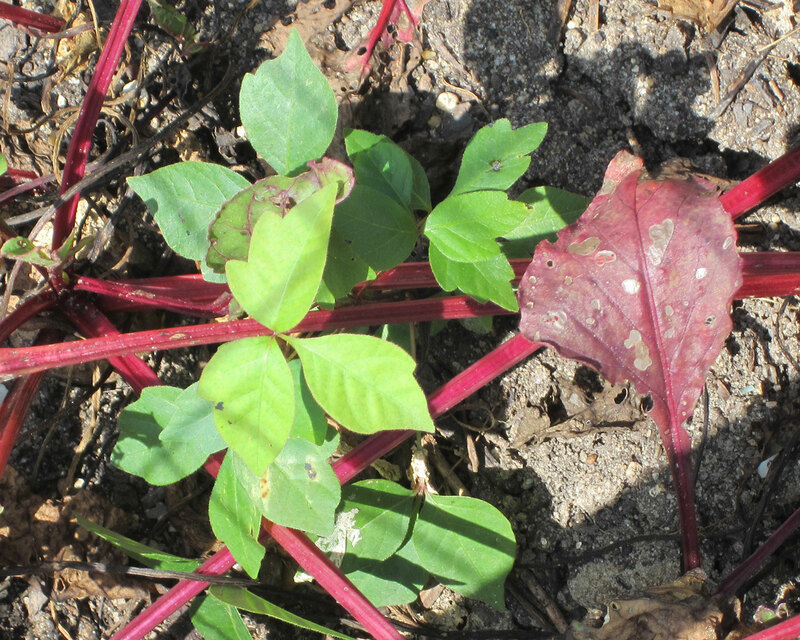 This shiny three-leafed plant is distinctive and it was growing right in a row of sun scorched beets that are begging to be pulled out. Birds eat the seeds and that’s probably how this was planted. I have had horrific bouts of poison ivy in the past and am very careful around it. Here is my solution to the occasional plant I find. Our local newspaper is delivered on rainy days in a long plastic bag. I save these for all sorts of gardening chores. 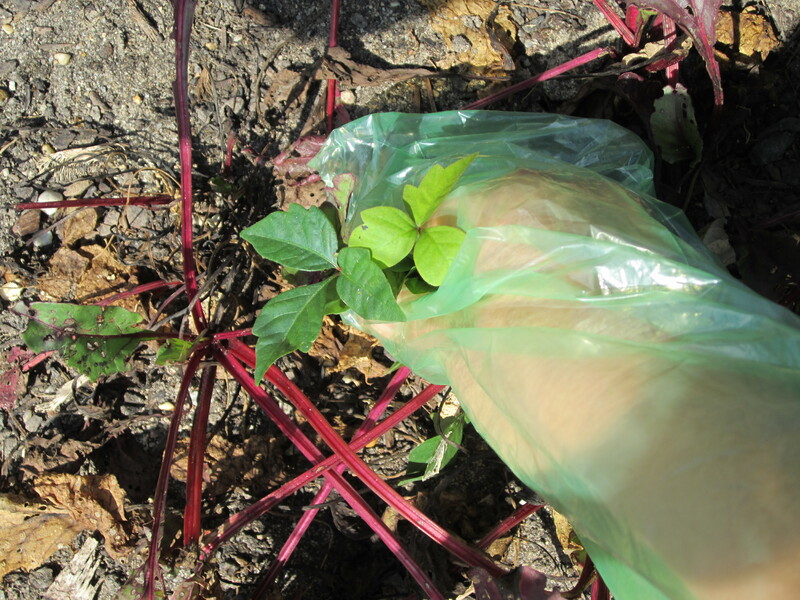 For poison ivy I slip my arm into the bag, pull the ivy, and turn the bag inside out over my hand. My skin never gets close to the oils on the plant which cause the oozing blisters. Use throw-away protection on your hands or over your gloves. The oils from the plant can get on your garden gloves and be transferred to your face. That observation is from personal experience. If you reach for something that even remotely looks like poison ivy, protect your hands and arms when pulling it. After measuring the bed, I had my husband cut the one piece of conduit, then laid everything out on the garage floor to see if in fact it would work. 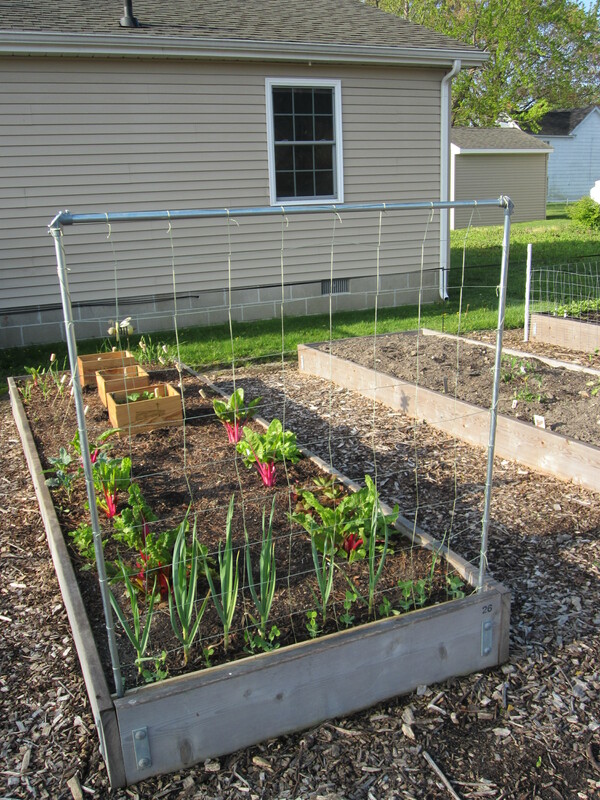 A few minutes later we headed down to the garden and quickly assembled the trellis. He pounded the rebar, tightened the screws and I tied. My peas are just starting to grow, so we’ll see how well it works. Tools: Hacksaw, Hammer, Screwdriver, Tape measure, Scissors, Use hacksaw to cut off 13 1/2″ conduit from one 5’ section – this will be the top. How To: Attach elbows to top of other two 5’ sections – these will be the sides. Unroll trellis and measure out 6’ length x 5’ width, thread one side conduit down 6’ length alternating the conduit in and out of the squares, measure over 4’ and thread the other side section. Attach top by threading through alternating squares. Cut netting to fit, allowing extra for tying. Pound rebar inside the corners 2’, don’t mash down top of rebar or it will not slide inside the conduit. Slide the conduit over the rebar, square it up, push conduit into ground to stabilize and tighten screws on the elbows. Tie off the squares of netting to top and sides or use wire ties. Optional: Pennie added a stabilizing stake to the bottom, threading it through alternating squares and securing it to the ground with irrigation stakes.